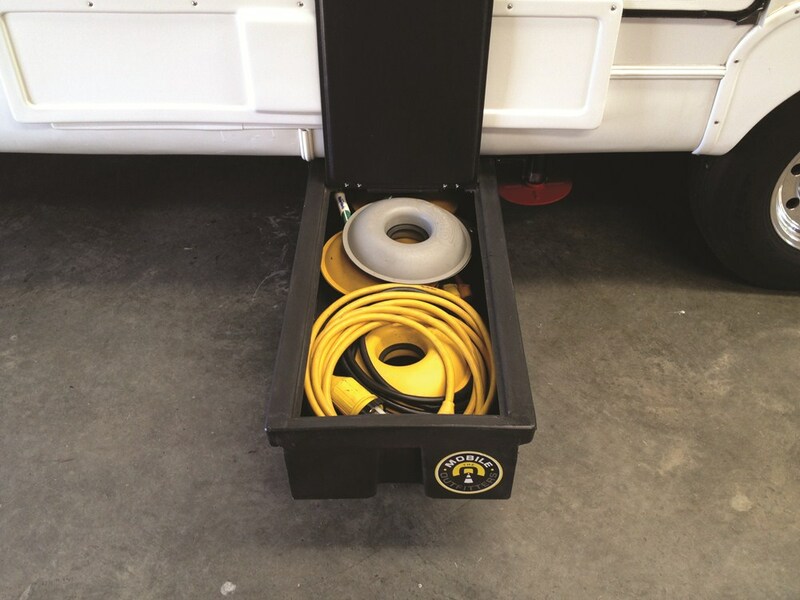 Stow supplies, tools, and equipment with this storage unit that mounts beneath your RV or trailer chassis. Two 48" long x 16-7/8" wide x 9" tall, slide-out bins with lids hold up to 100 lbs each. Bolts onto your trailer's frame. 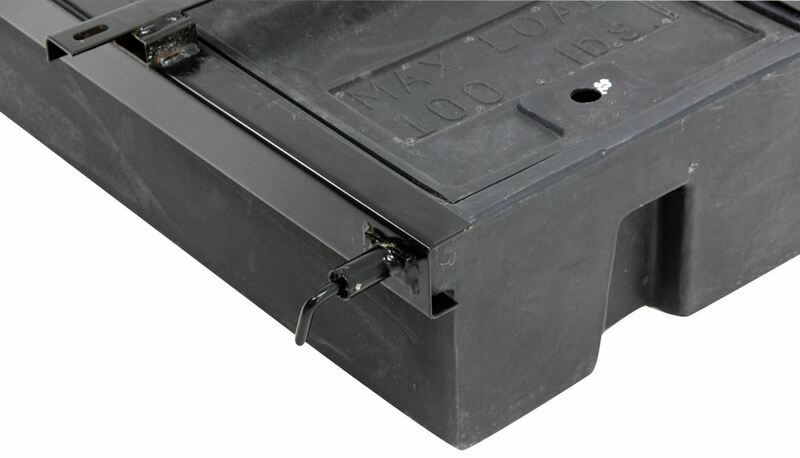 Lowest Prices for the best rv cargo from Lippert Components. 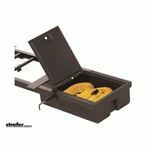 Lippert Underchassis Double Bin Storage Unit for RVs - 99-1/2" Long part number LC236558 can be ordered online at etrailer.com or call 800-298-8924 for expert service. 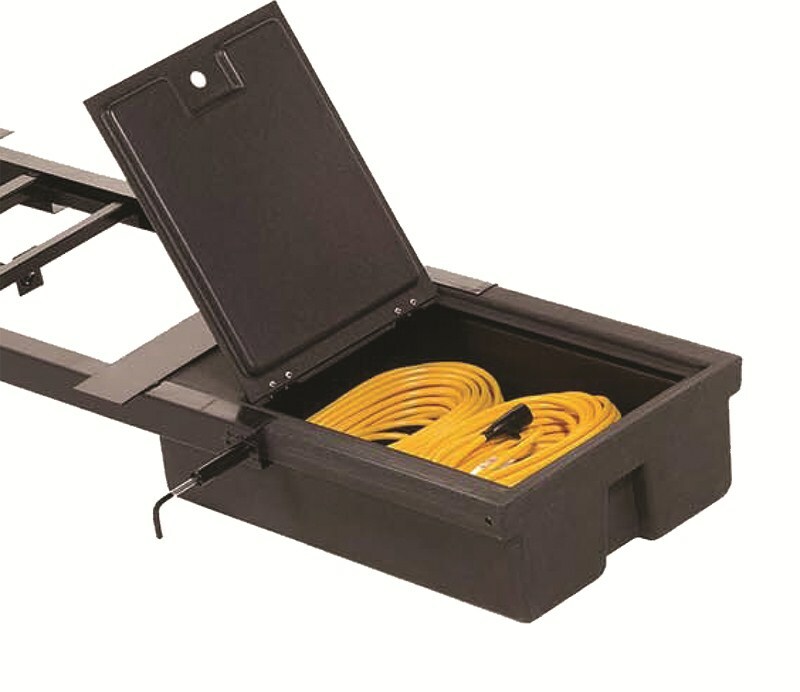 Order: RelevanceNewestRating - High to LowRating - Low to High Stow supplies, tools, and equipment with this storage unit that mounts beneath your RV or trailer chassis. Two 48" long x 16-7/8" wide x 9" tall, slide-out bins with lids hold up to 100 lbs each. Bolts onto your trailer's frame. Yes, check out the picture I attached to see the dimensions of the Lippert Underchassis Double Bin Storage Unit # LC236558. 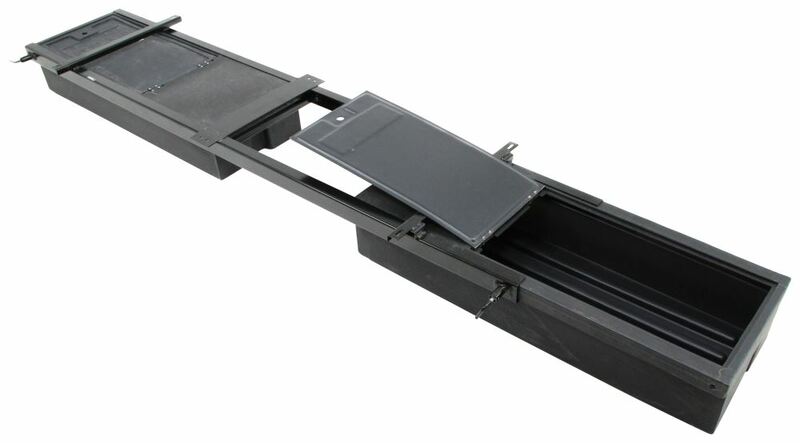 The bin dimensions for the Lippert Underchassis Double Bin Storage Unit # LC236558 that you referenced are 48 inches long by 16-7/8 inches wide by 9 inches tall. The # LC125460 has ben dimension of 27-7/8 inches long by 17 inches wide by 8 inches deep. I spoke with my contact at Lippert about the Underchassis Double Bin Storage Unit, part # LC236558. They told me that the mounting angle brackets are 1 inch wide. They gave me the distance from the end of the storage bin to the edge of the mounting angle. 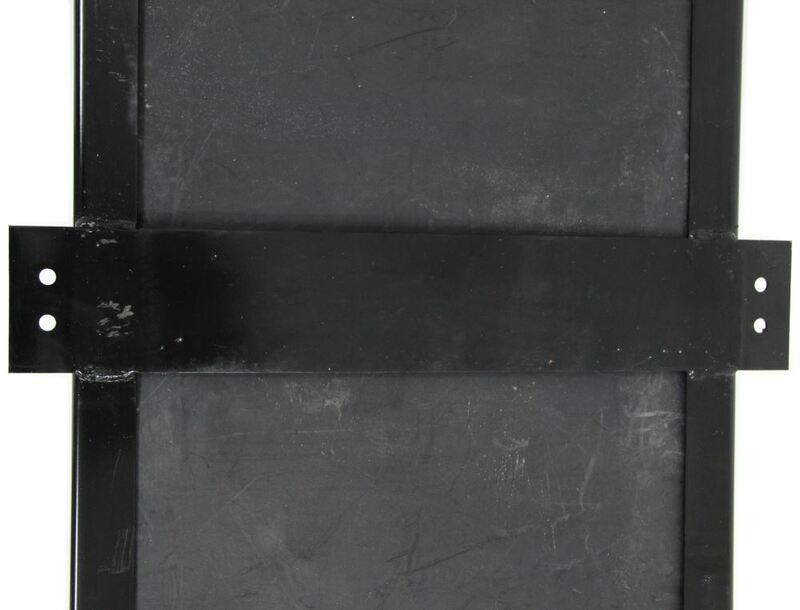 I have a photo of the storage bin with the dimensions noted. 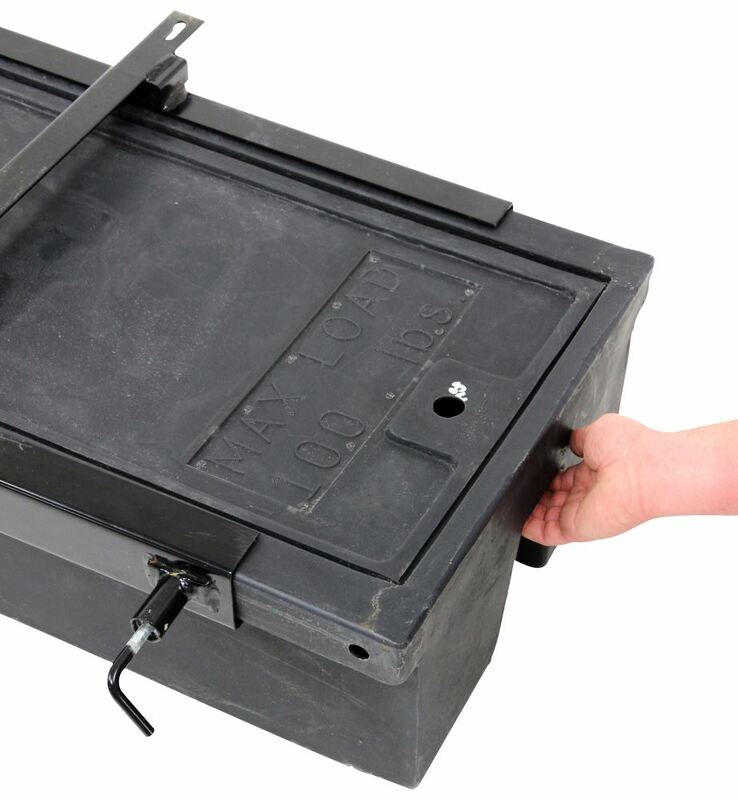 The distance between the mounting holes is 70-1/2 inches, and the edge of the first mounting bracket is 14-3/4 inches from the outside edge of the bin. The openings or lids on Lippert Underchassis Double Bin Storage Unit # LC236558 are approximately 26 x 17 but the actual space inside is longer than the lid so 48 long by 17 wide is correct. 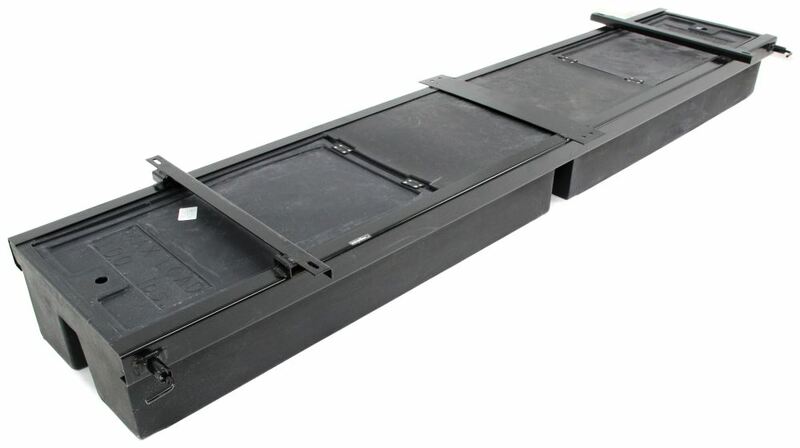 The drawers on the Underchassis Double Bin Storage Unit # LC236558 just slide in the steel frame. It does not have rollers. In order for something to be considered water tight or water proof it has to be able to be submerged and not leak any water. The Lippert Underchassis Double Bin Storage Unit # LC236558 that you referenced would keep things mostly dry under normal circumstances, but if you are planning on fording a creek or driving through a hurricane water would get in the bins. The bins don't include locks, so you would need to devise some way of locking them. A locking hasp like part # 720DPF with a padlock like # ML40D would be a good solution. Does Lippert Underchassis Double Bin Storage Unit Have Locks? 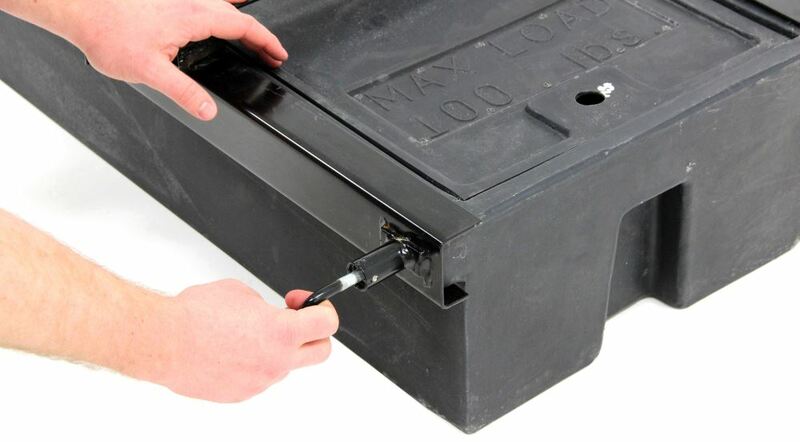 The Lippert Underchassis Double Bin Storage Unit for RVs # LC236558 does not come with a locking system for the lids so if you wanted them to be locked you would need to drill holes for a padlock. You would have to be pretty unlucky for your things to be stolen. The bins are underneath your trailer and someone would need to know that you have bins and how to access them. The center to center distance between the mounting brackets on Lippert Underchassis Double Bin Storage Unit # LC236558 is 70-1/2 inches. 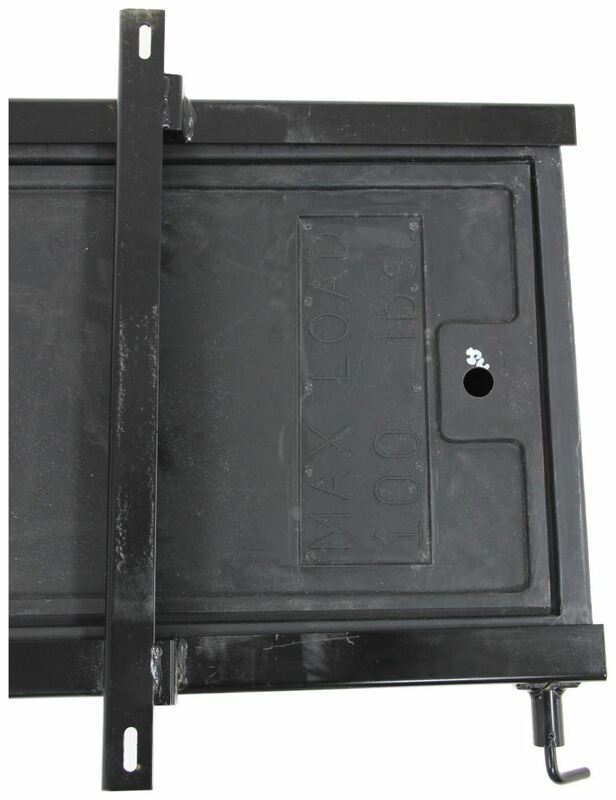 At 71.5 inches outside to outside on your trailer frame there will be enough contact between the mounting brackets and frame to be able to install this unit. As long as you have room for the part # LC236558 it would work well for you. It measures 99-1/2 inches long x 19-1/8 inches wide x 10-1/4 inches tall externally. 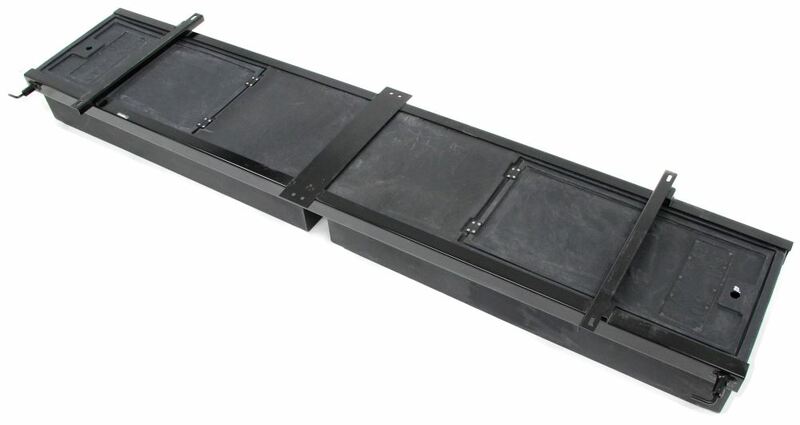 Can The Lippert Underchassis Double Bin Storage Unit Be Installed Lower To Clear Low Skirting? 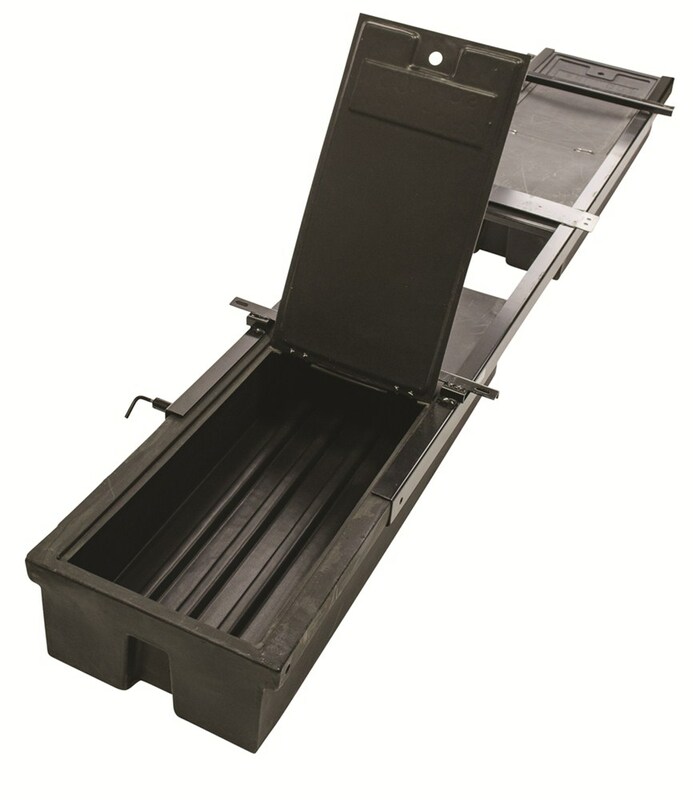 The Lippert Underchassis Double Bin Storage Unit for RVs - 99-1/2" Long # LC236558 has a difference of 1-1/4 inches between the top of the bin and the mounts. So you would need to add some spacers to give you the 2-2.5 inches you need to clear the skirting. It isn't an issue to hang the box lower as long as you have the support and also the ground clearance needed. The overall dimensions of the product are 99-1/2" long x 19-1/8" wide x 10-1/4" tall. 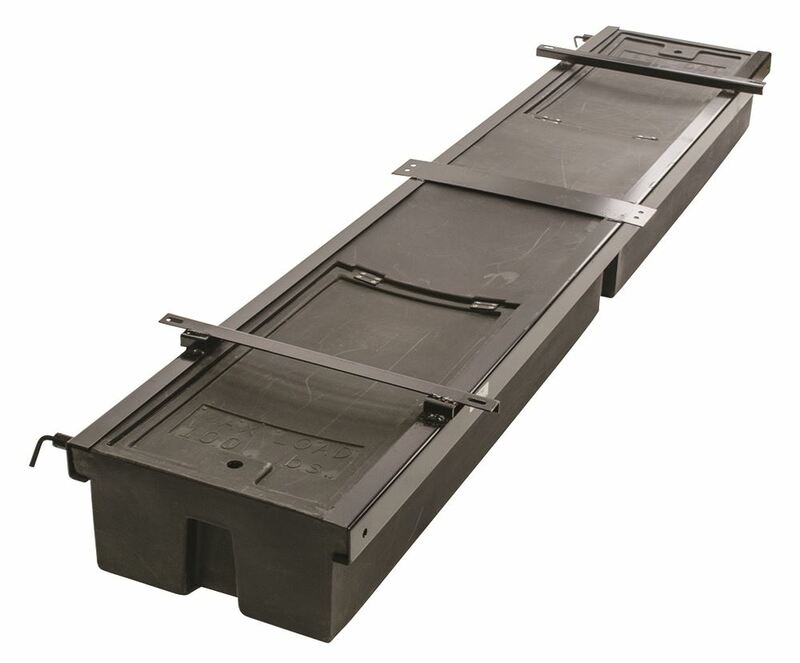 We do have a diagram of the Lippert Underchassis Double Bin Storage Unit # LC236558 that shows the overall 99-1/2" long x 19-1/8" wide x 10-1/4" tall dimensions as well as the mounting bolt hole locations as well. I have attached this diagram as well as a review video for you to check out.